Ora Ella far left (judging by other photo), youngest girl appears to be a grandchild as she is too young to be a sister. 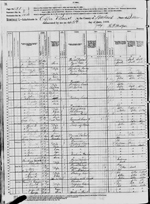 It is unclear where Ella was at the time of the 1880 Census in Illinois. Two census records have been found as possibilities. ---An Ella Scagg is found in the household of William Bailey as a servant. However, Ella's family is in Coffee Precinct in Wabash County. ---An Ellen Scags is found in the household of John Degan, Sr. as a granddaughter. It does not seem likely that John was a grandfather in some way to Ella. It may well be that neither of these is Ora Ella Skaggs (whose surname was given as Scaggs at times). Interestingly, a Garrett Bailey family was living next door to where Ella lived with her siblings and parents in 1870 in Coffee Precinct. It could be that a relative of this Bailey (perhaps close to the Scaggs family) was in need of assistance or the Scaggs family needed additional income, and Ella lived there helping out for a time, although she was only 14 at the time. 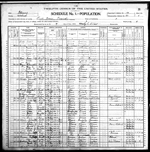 [S18718] 1900 US Census, 4113808-603/7/224 Lick Prairie IL.